The perfect appetizer is here! 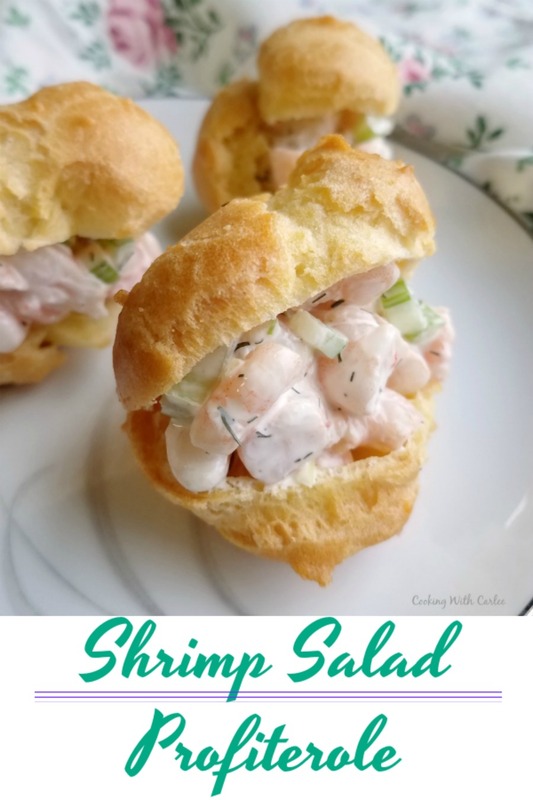 A buttery puff shell stuffed with delicious shrimp salad. It's a great starter, fun lunch and would be perfect served at a baby or wedding shower! Buttery choux pastry puffs stuffed with shrimp salad are perfect little starters. Their bright and fresh flavors are made even better by the fun little package they are served in! 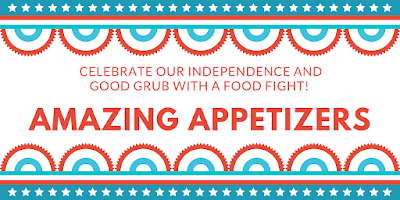 We decided the 4th of July would be a great time to host the next installment in our friends and family cook-offs. We've had so much fun hosting and competing in the poultry grill-off, the pie off, the soup off and the chili cook-off. The winner's board is growing and we were ready to add the next name. After tossing around some ideas, we settled on appetizers for the theme. So I dubbed it the finger food fight! I was really tempted to do some sort of deconstructed shrimp stuffed jalapeno popper. I could see it in my mind, but couldn't decide exactly how I wanted to make a couple of the components. Maybe next time! I still had shrimp on the mind though. I considered a warm dip since the Cajun shrimp dip is always a hit, but then decided something chilled might be nice on such a hot day. That's when I settled on shrimp salad. 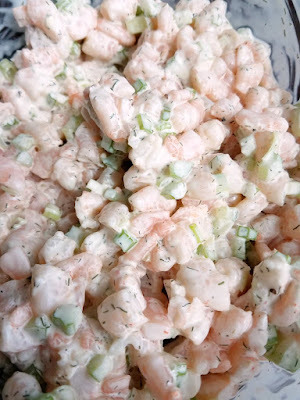 I am a huge fan of shrimp salad and it would be a relatively easy recipe to throw together while also getting everything else ready for the party. The filling is great served a number of different ways. It makes a great little sandwich when served on Hawaiian rolls. Shrimp salad is also a great dip for pita chips and is perfect piled on top of buttery crackers. I thought it may have a chance packaged any of these ways. But then I thought of creme puffs and I knew I had my answer. While these little puffy pastries look intimidating, they are really quite easy to make. The dough is whipped up in a saucepan. Then it would be customary to pipe them onto parchment lined baking sheets. I took the easy way out and scooped them with my small cookie scoop instead. It worked great and I got relatively uniform puffs! One of the advantages of the puffs is they can be baked a day or two in advance. Just be sure to let them cool completely before you put them in an airtight container. You don't want soggy puffs! I ended up with 4th in the competition. My family members are suckers for my cousin Cori's stuffed mushrooms, so I never had a chance! Despite the defeat, I can't wait to have another excuse to make these. 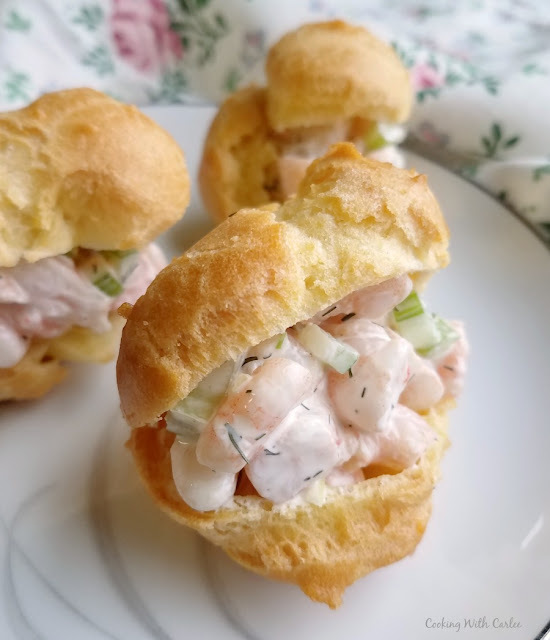 I think they would be a fun way to start a dinner party, a fun spring or summer lunch for company or they'd be perfect at a bridal or baby shower! 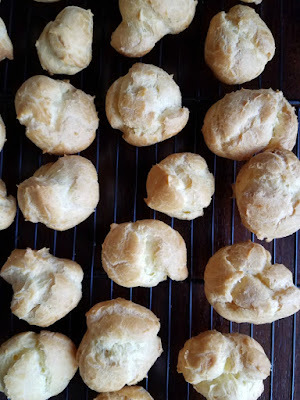 Have you ever made choux puffs? What are your favorite sweet and/or savory fillings? Preheat oven to 400 F and grease 3 baking sheets. Place the butter, water and salt in a large saucepan. Heat over medium heat until the butter is melted and the water starts to boil. Remove from the heat and add flour all at once. Whisk vigorously to incorporate. Return to the heat and cook for about 2 minutes, stirring the whole time. The dough should form a smooth ball. Remove pan from heat and let cool for about 7 minutes. Add the eggs, one at a time, beating well between each addition. It will take a bit of work to get each egg incorporated. Just beat away until it is completely incorporated before you add the next. The dough should be shiny when you are done, but thick enough to hold it's shape when you pipe it. If it starts looking too loose to pipe, stop adding eggs. Pipe or scoop rounded teaspoons of dough onto prepared baking sheets, leaving a couple of inches between each ball of dough. Bake at 400 F for 15 minutes then reduce the temperature to 350 F for 25 more minutes. Quickly cut a small slit in each puff and return to the oven for 5 more minutes. Once finished, remove to a wire rack to cool completely. Store in an airtight container until ready to assemble. Finely dice the celery and green onions. Roughly chop the shrimp. In a bowl, stir together the mayonnaise, dill, lemon juice. Season with a pinch each of salt and pepper. Stir in the shrimp, celery and green onions. Taste and adjust your seasoning to you liking. Cover and refrigerate until ready to use. Cut a slit across the equator of each cream puff. Stuff with as much shrimp salad as you can fit in there! It is so much easier than you'd think and could be stuffed with all sorts of sweet or savor fillings! 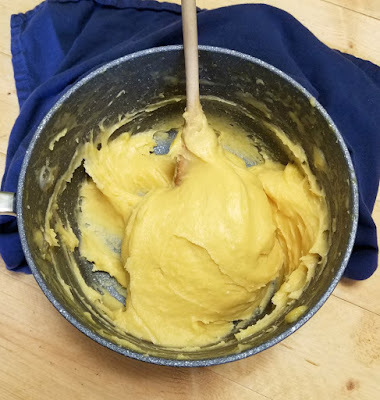 I recently made choux paste for the first time and it's so easy. Can't wait to make these gems. They look delicious. Isn't it so fun to make?! I am so impressed that you made the shells too! I'm pretty sure that if I had been there, that you would have got 1st place! These look fabulous! Thank you!! The shells are actually fun to make! I need to make more choux, it is so fun to play with! 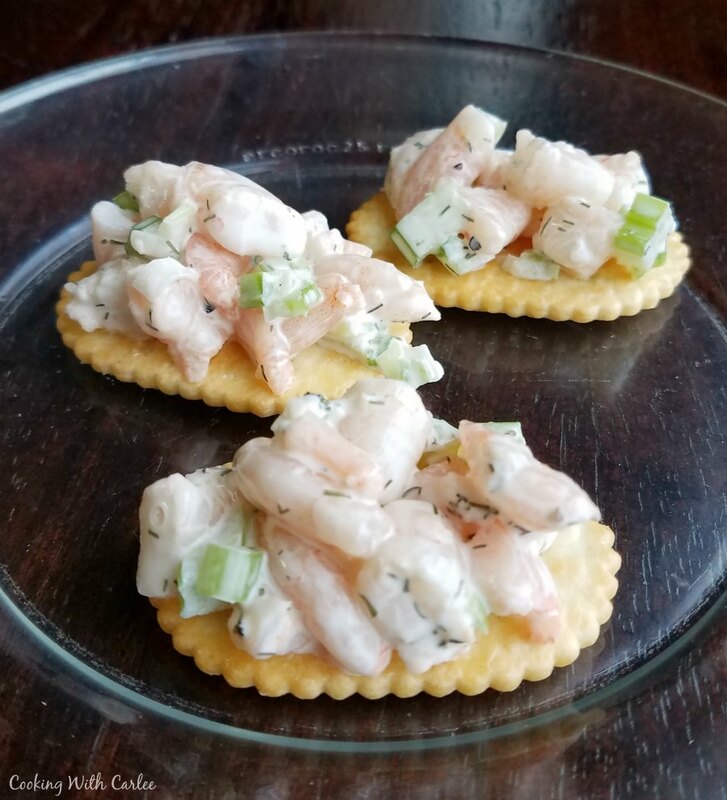 This will be a great appetizer for a summer party! Thanks so much for sharing with us at Full Plate Thursday and sure hope you have a great week! I always love your shrimp recipes! I've must try this one! Thank you! This is one of my favorites! I have a bunch of shrimp lovers in my house. Everyone would love it! 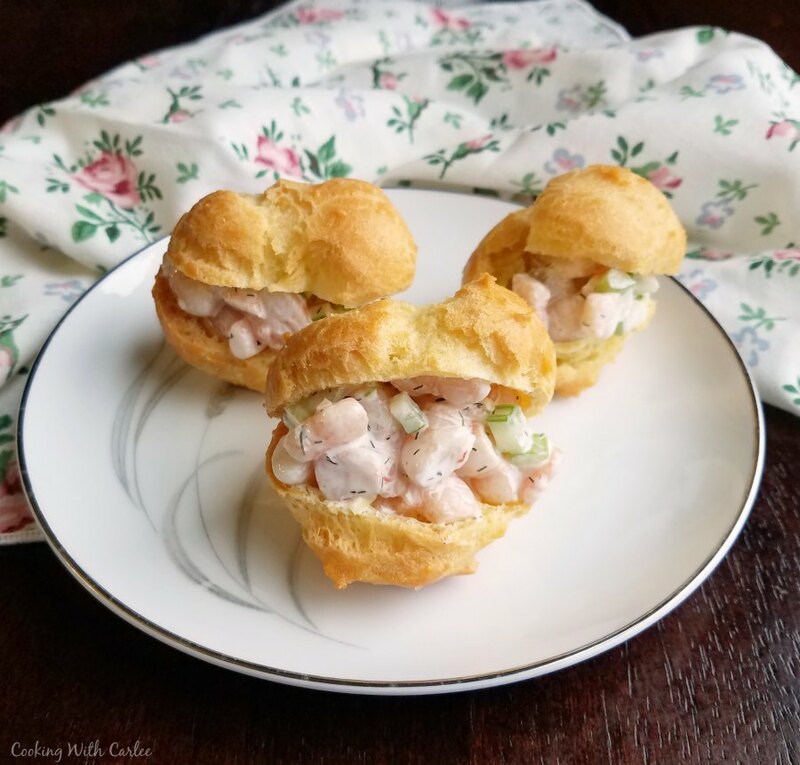 Looks fancy AND delish.Thanks so much for sharing with us at the Whimsical Wednesdays Link Party! We are shrimp lovers too so these were gobbled up! Thank you!